Remember I recently complained about a library visit and how there were no new books? Well, they showed me this time! Not only were there new books but books from authors I really enjoy. So my intention was only to go and return a book and I ended up walking away with four new books. To Die But Once by Jacqueline Winspear. How did I miss this latest installment? Maisie Dobbs is one of my favorite series so I can’t wait to see what Maisie will be investigating this time. The book is set in the Spring of 1940 during the months following Britain’s declaration of war on Germany. 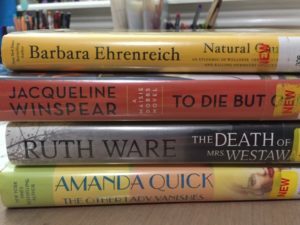 The Other Lady Vanishes by Amanda Quick. When I want to read a bit of romance, Amanda Quick’s books are my go-tos because her female characters are intelligent and strong. I’m used to her historical novels being set in the 1800s but this time she’s set her story in the glamorous era of the 1930s. Looking forward to this one. A lot of books and not enough free time. Anyway, which book would you start with and/or have you read any of these? The Other Lady Vanishes sounds like fun; I love Amanda Quick. And the Ruth Ware book is on my TBR list. I don’t know how I’d decide between the two. Good luck! The Ruth Ware book is on my list, but all the others sound good, too! Natural Causes sounds like something I’d enjoy. Isn’t she the author of Nickel and Dimed? I’ve always wanted to read that one, too.